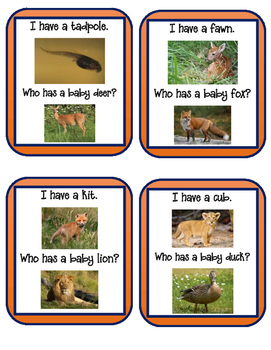 24 I Have Who Has cards for baby animals. 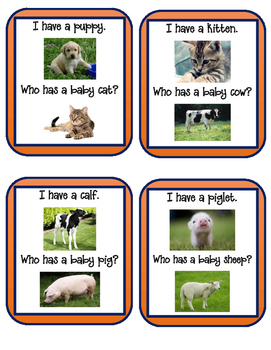 Each card has an "I have" statement naming a baby animal with a picture showing that baby animal. 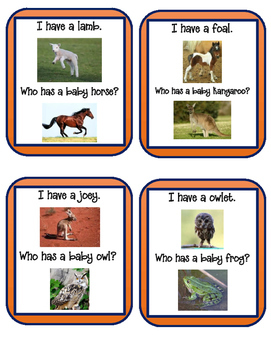 The card then has a "Who has " question asking for another baby animal naming and showing an adult picture. The first student reads their card, "I have a puppy. Who has a baby cat?" The next student reads, "I have a kitten. Who has a baby cow?" 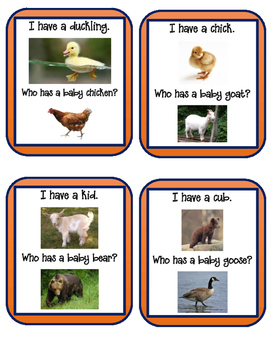 Continue so that the last student ends with the question, "Who has a baby dog?" At which time the first student ends the round by reading, "I have a puppy."